ELLA is run entirely by volunteers! Every Spring, the Edmonton Lifelong Learners Association (ELLA) puts on a three week intensive learning opportunity for anyone over 50 years of age. It is a wonderful experience on the U of A campus, featuring excellent instructors, stimulating topics, opportunities for daily physical exercise, plenty of social interaction. ELLA “regulars” look forward to this entrance to Spring every year in early May! It is people like you and I who put this all together, using skills we have acquired at home and at work. We still get a kick out of developing something unique….but for ourselves. ELLA has an amazing bunch of volunteers doing most of the work, which makes it both fun and satisfying. If you are planning to come to this Spring Session (or even if you are not), please consider volunteering for ELLA next year. It takes many hands to do the work. We have a job tailor-made to suit your time, energy and capabilities. We are also willing to provide training to help you acquire skills needed if necessary. The Administration Committee shall ensure that the ELLA Office is managed in a way that meets the needs of the organization. Providing timely administrative support to committees, including collaboration with the University of Alberta, to enable them to effectively fulfil their responsibilities. Managing the daily operation of the ELLA office. Training volunteers to run the office and support V-office activities. Collaborating with the IT Committee and the U of A where applicable to maintain the member database and generate reports as required. Contributing to planning and implementation of the Strategic Plan. Preparing an annual Committee budget for Board approval and adhering to it. Maintaining and annually updating the Administration Committee Handbook of Information and Procedures. The Board Recruitment and Development Committee shall recruit board members with the necessary qualifications, provide appropriate orientation and training for board members, and evaluate the effectiveness of the board in carrying out its work. Developing a skills matrix that reflects the requirements of the board. Recommending a list of possible board nominees to the April meeting of the board. Arranging at least one board development function per year. 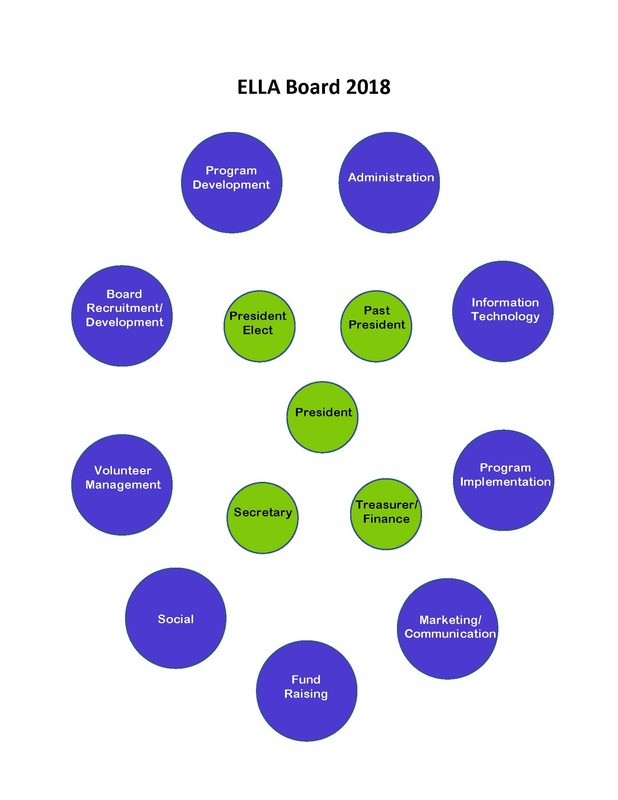 Arranging support for individual board members who wish to take training to enhance their effectiveness on the board. Overseeing an evaluation of the effectiveness of the board on a regular basis. Preparing an annual committee budget for board approval. Maintaining and annually updating the Board Recruitment and Development Committee Handbook of Information and Procedures. The Finance Committee shall ensure that fiduciary responsibilities of ELLA are met. Assisting the Treasurer in drafting policies and procedures to ensure that the finances of ELLA follow Generally Accepted Accounting Principles (GAAP) and meet legal requirements. Ensuring that financial decisions are made ethically and with integrity to support the organization and its long-term viability. Assisting committees in preparing their annual budgets. Preparing and submitting a consolidated ELLA Annual Budget for Board approval. Undertaking financial projects and assignments as delegated by the Board. Ensuring that annual Financial Statements are properly audited or reviewed and submitted for approval at the AGM. Contributing to the planning and implementation of the Strategic Plan. Maintaining and annually updating the Finance Committee Handbook of Information and Procedures. The Fund Raising Committee shall explore fund raising avenues that support the purposes and programs of ELLA. Identifying needs in the ELLA program that qualify as fund raising opportunities. identifying fund granting agencies whose purposes match those of ELLA. Preparing and submitting fund raising proposals. Arranging for fund raising events approved by the Board. Maintaining and annually updating the Fund Raising Committee Handbook of Information and Procedures. The Information Technology Committee shall ensure that the on-line functionality and presence meet the requirements of the ELLA Board, Committees and Members. Developing and maintaining the information technology programs needed to support the current operations of ELLA. Representing ELLA and collaborating with the U of A re electronic system upgrades, changes, and enhancements. Training and supporting committee members and volunteers on technology and software to support their committee functions. Advising the Board as to requirements for ensuring the future electronic functionality of ELLA. Maintaining and annually updating the Information Technology Committee Handbook of Information and Procedures. The Marketing Committee shall ensure that members and the general public are informed of ELLA and its programs. Managing ELLA marketing in order to advertise, publicize and promote our organization and programs. Ensuring consistent branding and messaging of marketing material. Ensure the consistency and current nature of information by serving as a clearing house and editor for ELLA information. Collaborating with appropriate committees and the U of A to gather the information needed to market ELLA Spring Session. Preparing the ELLA Spring Session Course Guide. Maintaining communications with ELLA members throughout the year. Managing photographic records of ELLA. Maintaining and annually updating the Marketing Committee Handbook of Information and Procedures. The Program Development Committee shall plan, direct and evaluate ELLA’s educations programs for Spring Session. Identifying learner needs using evaluations, surveys and other feedback from members. Planning learning elements of Spring Session programming to address identified learner needs. Identifying and contacting proposed instructors and speakers to meet the learning goals of the Spring Session with regard to topics and balance. Collaborating with University of Alberta Extension to vet proposed instructors and courses to meet the standards of the U of A, and to ensure contracting and payment of these instructors. Collaborating with other ELLA committees to ensure venue booking, production of communication and publicity materials, course guides, and course materials, as well as minimize duplication of learning events. Designing, executing and analysing course and program evaluations for ELLA Spring Session. Preparing a final report on Spring Session. Maintaining and annually updating the Program Development Committee Handbook of Information and Procedures. The Program Implementation Committee shall ensure that all components of ELLA Spring Session are delivered in a way that creates an enjoyable learning experience for participants. Collaborating with appropriate ELLA committees and U of A as required to obtain the information required to support Spring Session. Booking space and equipment for all aspects of Spring Session. Monitoring enrollment re room changes, cancellations. Identifying, training and communicating with Facilitators, Ambassadors, and technical support. Providing instructors with an orientation concerning smart room technology and handout preparation. Setting up and operating an Information Table. Hiring the Spring Session Assistant for the Information Table. Providing on-site support for volunteers, instructors and members throughout Spring Session. Maintaining and annually updating the Implementation Committee Handbook of Information and Procedures. The Social Committee shall ensure that ELLA Board approved social events are delivered. Organizing all aspects of ELLA Board approved social functions. Organizing entertainment and audiovisual requirements if included in social events. Collaborating with the appropriate committees to honor long-term members of ELLA and volunteers. Maintaining and annually updating the Social Committee Handbook of Information and Procedures. The Recruitment Committee shall ensure that all Committees have qualified individuals to fulfil assigned responsibilities. Developing and implementing an annual plan to recruit committee volunteers. Assisting ELLA Committee Chairs to identify and recruit volunteers to fill committee positions, matching volunteer skills with committee needs. With the IT committee, ensuring an up-to-date list of all volunteers is maintained and accessible. Ensuring appropriate appreciation for ELLA volunteers. In collaboration with the Finance Committee, identifying and nominating at the AGM suitable persons to perform an annual financial audit or review. Maintaining and annually updating the Volunteer Recruitment Committee Handbook of Information and Procedures.